A good night for THE BACHELORETTE. ABC: THE BACHELORETTE rose 0.2 to 1.6, and THE PROPOSAL was up 0.1 to 0.8. 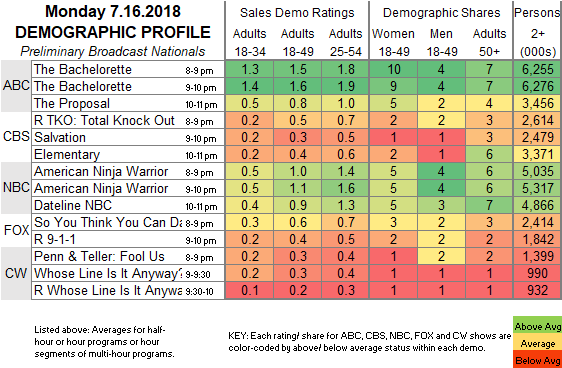 NBC: AMERICAN NINJA WARRIOR gained 0.1 to 1.1, and DATELINE was up 0.3 from last Monday’s episode to 0.9. CBS: After a rerun of TKO; TOTAL KNOCK OUT at 0.5, SALVATION held at 0.3, and ELEMENTARY was at 0.4. 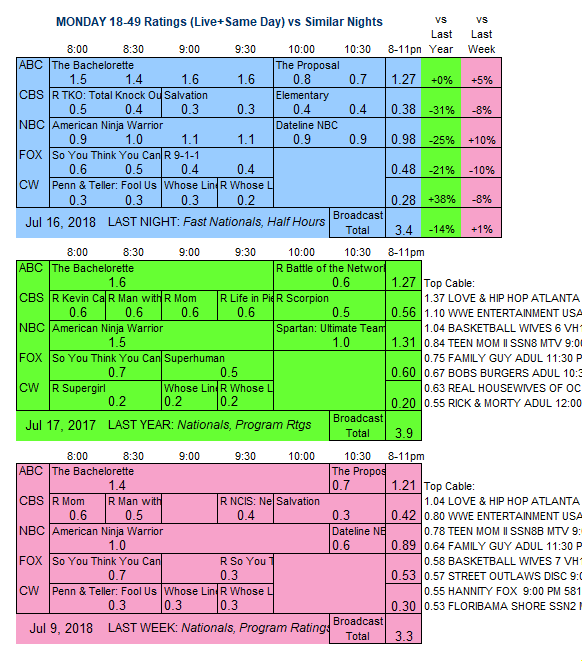 FOX: SO YOU THINK YOU CAN DANCE lost 0.1 to 0.6., and was followed by a 9-1-1 rerun at 0.4. CW: PENN & TELLER: FOOL US and the new WHOSE LINE IS IT ANYWAY held at 0.3/0.3, and the rerun WHOSE LINE was down 0.1 to 0.2. FOX has the MLB ALL-STAR GAME tonight, and on cable, AMC airs the 2-episode season finale of HUMANS.